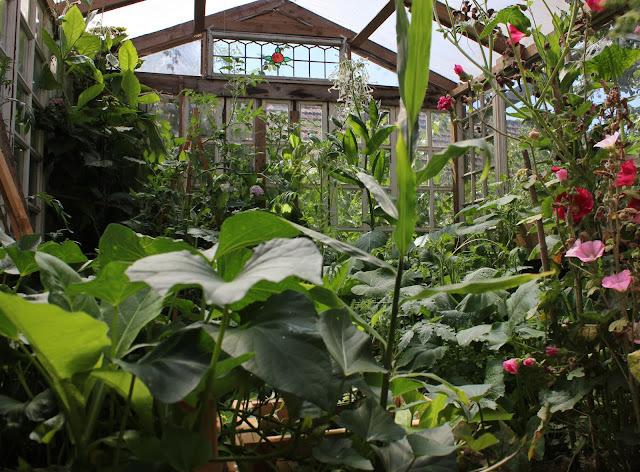 DIY verandah-style greenhouse, sunspace, draught lobby from recuperated materials. 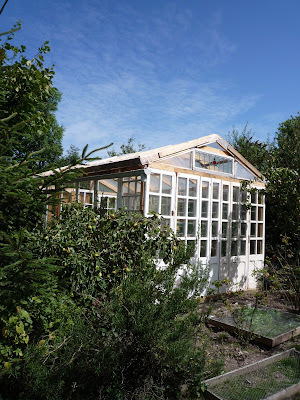 I love this greenhouse because it seems so right in the surrounding rural scene and because it is made from such an interesting eclectic mix of recuperated materials including ships timbers, giant industrial packing cases and discarded pairs of French windows (here in France they are called 'door windows'). It also has multiple uses, providing water for the sheep and poultry from its roof, a reading room on a wet day for grandchildren, as well as the usual and expected year-round food production. I also view it as a prototype for something we want to build, which is a sun space on our own tiny house. Eight years ago, when my neighbour, Bernard saw the recuperated-glass greenhouse I’d built, he wanted to follow suit and build his own. It took 7 years for him to ‘bite the bullet’ and finally fulfil his ambition. It was well worth the wait in this robust yet deceptively 'light' and 'airy' design. Before retiring, Bernard was an engineering technician and was involved in the installation of steam turbines at sites in Europe and the Middle East. He very prudently recuperated the wood from the crates used in transporting the turbines and brought it home to be stored in his shed. He also took some old ship timbers stored on his sister's farm before it was sold, these he used in the central roof support (see below). For the recuperated windows I took him to the joinery company from where I obtain all mine. The proprietor had already expressed his gratitude that someone (me) was taking his ‘rubbish’ and putting it to good use. Fortunately for Bernard on the day we went to see what was available, we found that the company had just completed a contract for replacing the windows in a large house. The result was that we filled Bernard’s trailer with 7 pairs of wood-framed double-glazed French windows. 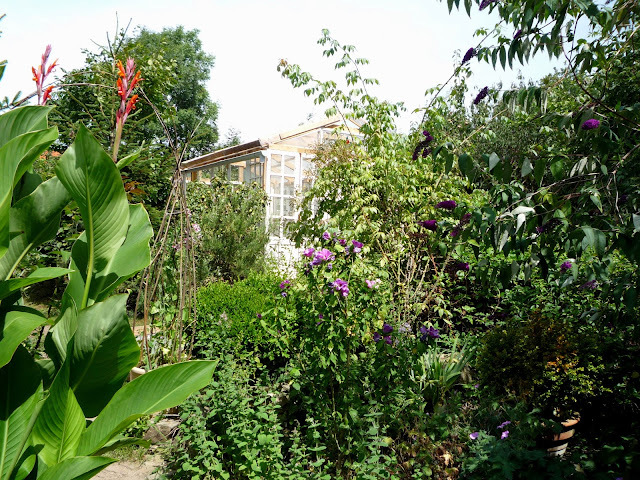 Some years’ ago there was a strip of land that ran alongside Bernard’s garden owned by a retired guy who grew vegetables on it. 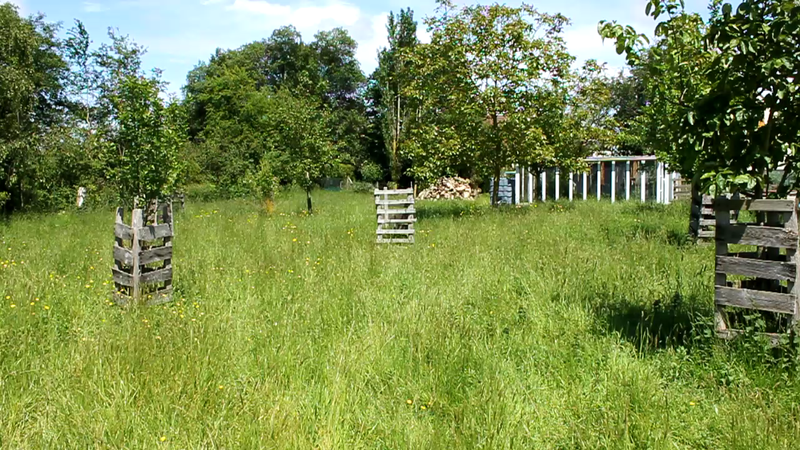 He sold this to Bernard when he moved away and on removing the fencing that separated the plots Bernard also removed the concrete foundation for this fence. These reinforced concrete beams were moved into his lower field for ‘safe keeping’. You can see them here, put to good use. 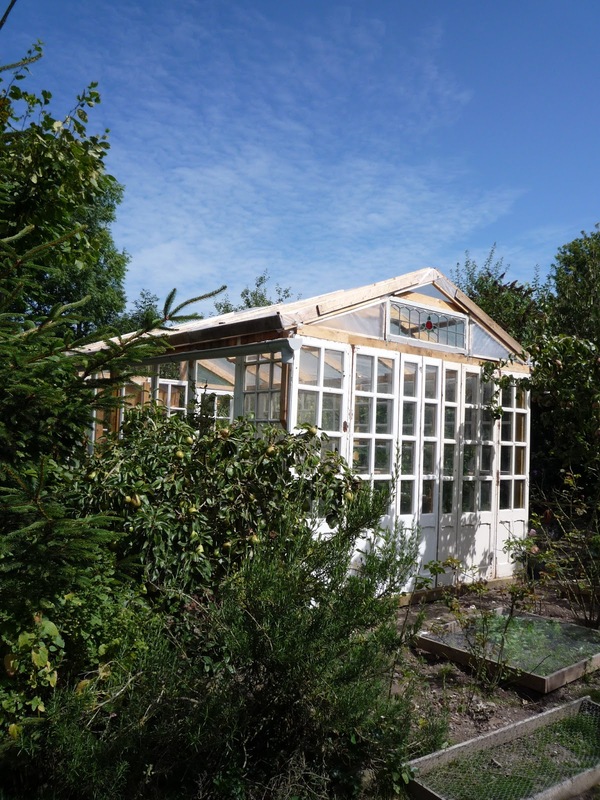 Bernard had erected a garage-sized ‘shed’ on his land in which he stored recuperated timber. 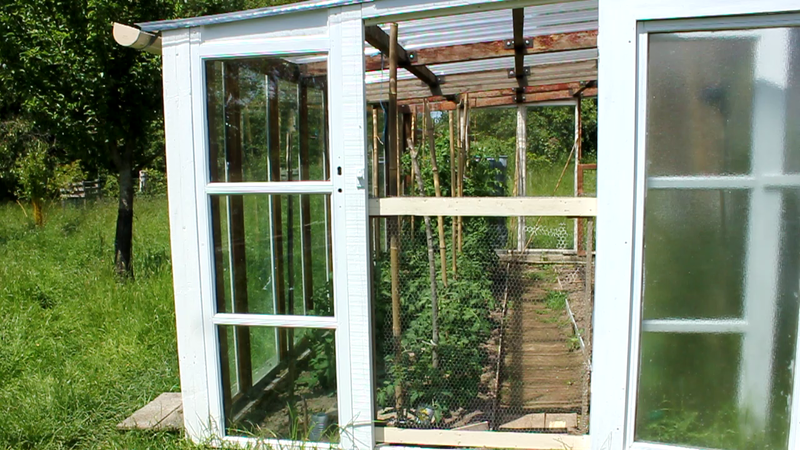 The western elevation was chosen as the rear wall for the greenhouse. 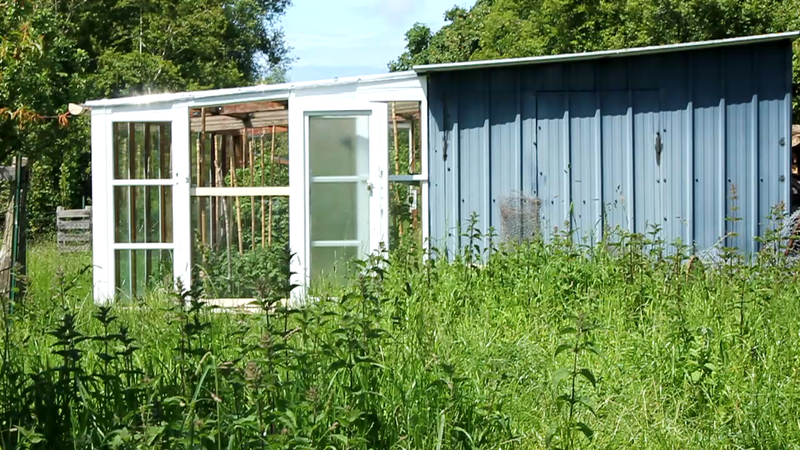 The garage/shed was steel-framed and clad in corrugated steel sheet. And had a single-pitch roof sloping to the western elevation. The concrete beams were laid directly on the ground to form a ring beam and a mild steel angle iron was secured to it. Vertical wooden posts were secured to the garage wall from which the roof rafters could be attached and these in turn were attached to a wall plate supported by three uprights extending up from the ring beam. Bernard fabricated his own joist hangers, to support the rafters, from scrap steel sheet. Additional support for the roof sheets was provided by noggins nailed between the rafters. The windows were supported on the ring beam and were bolted to the upright face of the angle iron and to the wall plate at the top. 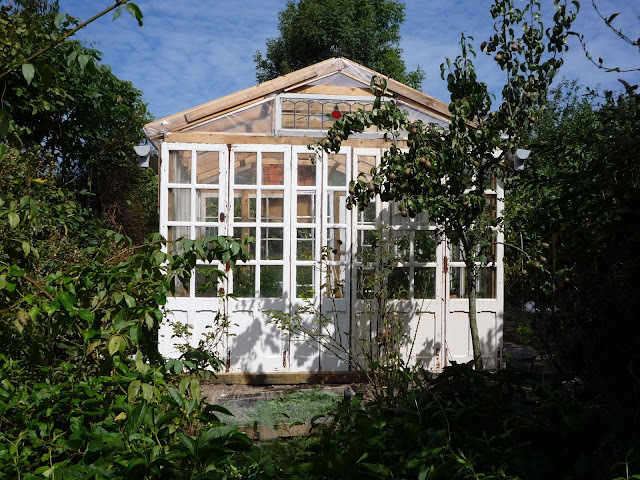 Provision was made for a door at each end of the greenhouse and once again suitable ones were obtained at our friendly joinery company. 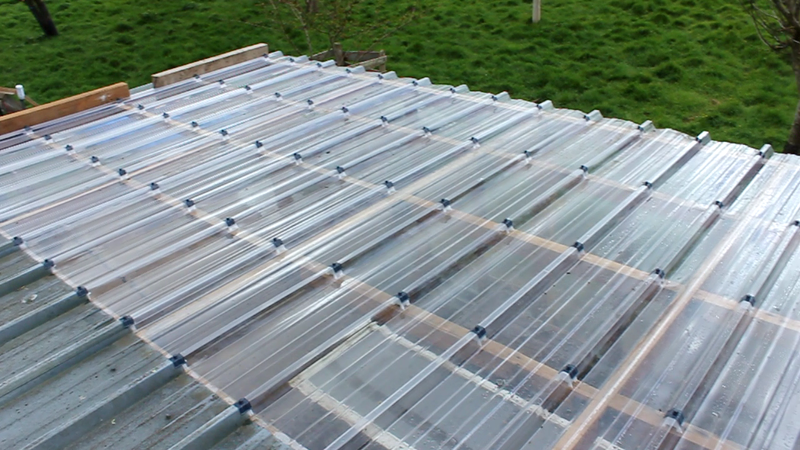 The roof of the greenhouse was of clear, rigid plastic. 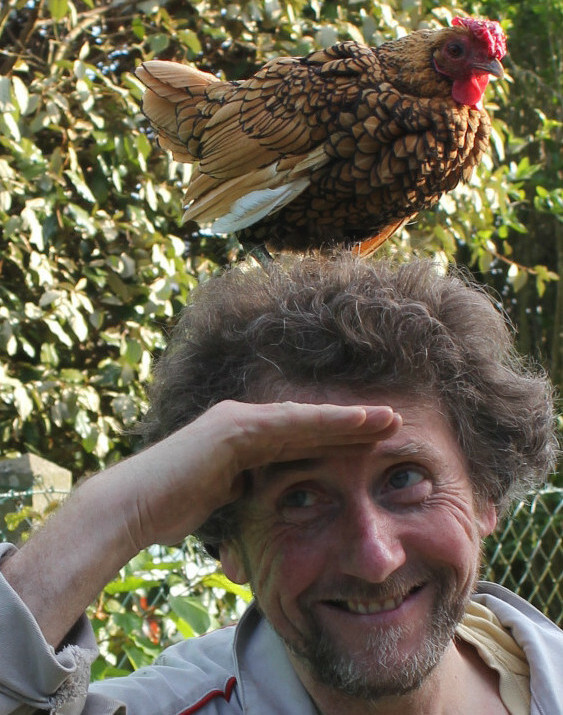 Bernard was able to match the profile of the roof sheet to that of the metal roof cladding of the adjoining shed. 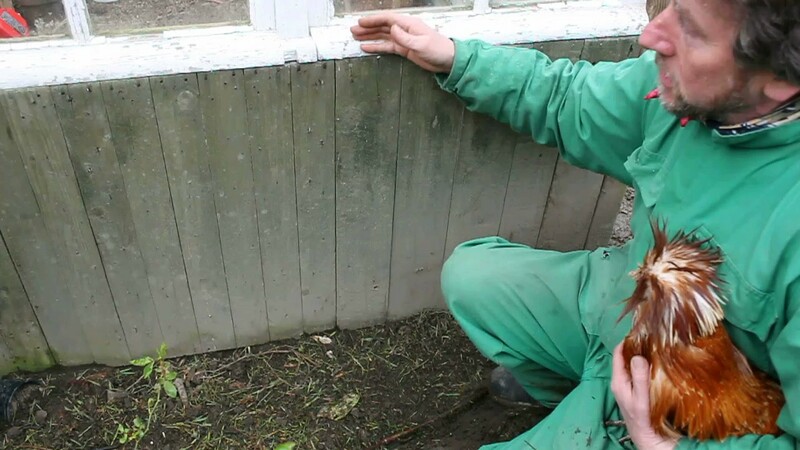 Thus, by sliding the plastic sheet beneath the edge of the metal one, there was a weatherproof joint which would allow rainwater to run from the shed roof into guttering on the greenhouse roof perimeter. As mentioned above, a gutter was fitted to collect the rainwater run off from the combined roofs (approximately 50 m²) and this was stored in a 1m³ food grade plastic container, thus providing adequate supply of water for irrigation in the greenhouse and as a bonus providing a clean water source for the animals grazing in the field. After almost 2 years use, Bernard is really pleased with the increased yield from the prolonged growing season in the greenhouse and his only regret is he did not do it sooner. The cost for the roofing was obviously the biggest expenditure in this construction, but the resulting benefits of rainwater harvesting and structural integrity have proved it was a wise investment. 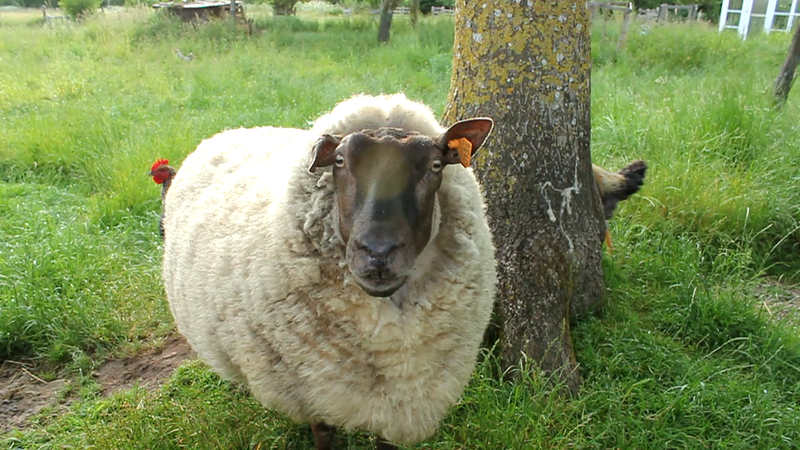 The sheep and chickens are happy too! I really like this project because it is a robust, weatherproof construction which could easily be adapted to provide a conservatory or draught lobby to a house. It looks as if this is what we’ll be undertaking later this year in front of our tiny house in the garden. I’ll keep you posted!! 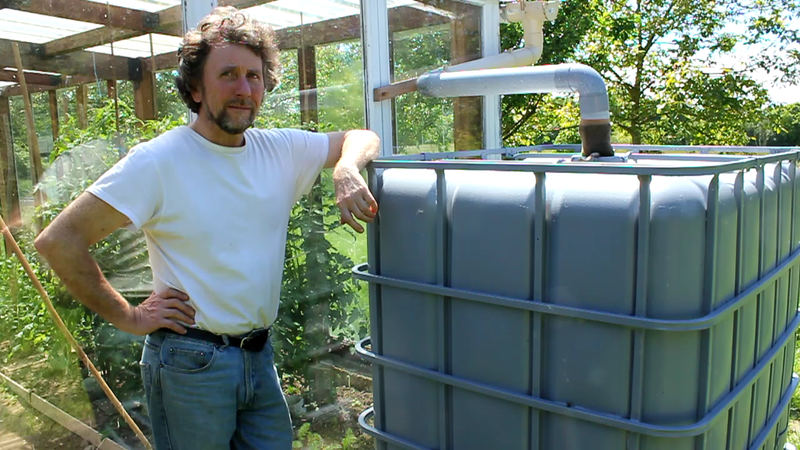 Make a Wooden Fuelless Cooker or Hay-box - No Power? No Worries. Hot Food. The cardboard box version of the fuelless cooker as described in my post a few days ago is fine as a 'quick fix' or an emergency back-up. In this post I'll share how to make a more robust model which you can keep to hand in the kitchen or, as we show in the film, to take in a car to provide hot, nourishing food on a journey. There are two ways you can use a fuelless cooker, firstly you can use it to cook a whole meal, this was the way it was used in previous centuries both for men and women working in the fields and long distance travellers and how we used it in the film. Secondly you can use it in your kitchen, to save energy when cooking a stew or similar dish, which requires slow cooking. 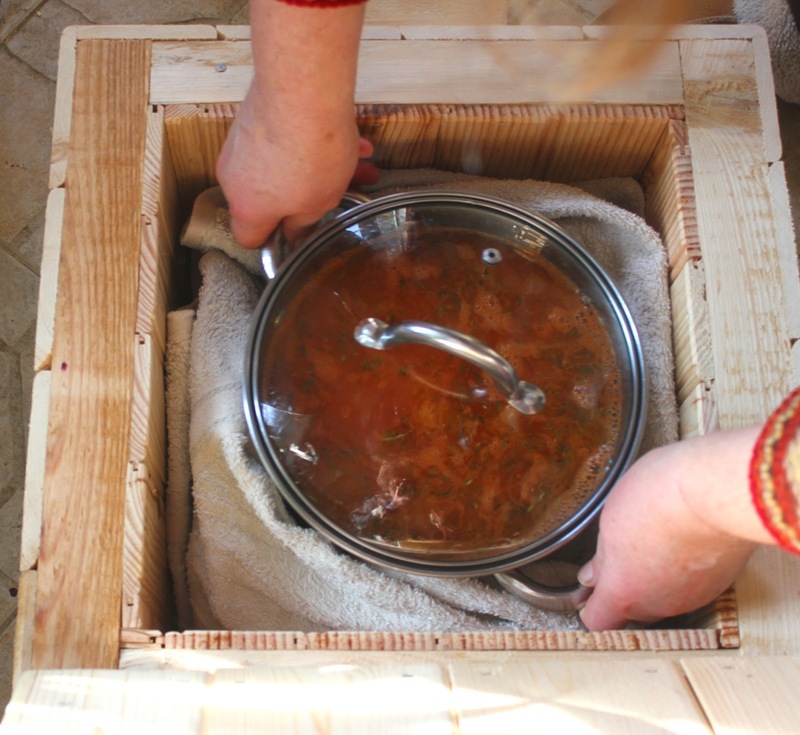 We actually did this too with our cassoulet when we returned home in the evening, taking it from the box, where it was still quite warm and transferring it to our wood cooker. I have to tell you that after several years of making and eating this dish it was the best we had ever eaten! Furthermore we had saved on four hours of fuel. Our wooden box sits next to the telephone and is robust enough to act as a comfortable low seat. It was made using pallet wood and 10mm (3/8") thick pine cladding. This latter was left over from when I made the hen house last year. The insulation was 45mm (1¾") thick organic hemp and vegetable fibre, purchased in a 1250mm x 600mm (4' x 2') sheet for about $5.00. I based the design of the box around our largest saucepan and for ease of loading when hot, the lower portion of the box was not much higher than the two handles on the side of the pan (as seen above). The box lid was deep enough to fit over the portion of the pan standing above the box rim. Both the base and the lid were made in the same way, that is the vertical sections that made up the inner and outer walls were stapled to an upper and lower square frame, the width of the frame was the thickness of the insulation. I arrived at the box dimensions from the size of the saucepan. This size would be the minimum internal dimension of the box. To arrive at the outside wall height for the box base I had to add the thickness of the box bottom, the insulation and the thickness of the platform wood. I always tend to regularly check the measurements especially prior to cutting the wall material - better to be safe than sorry! I had originally thought of making the frames like picture frames, with mitred corners but decided against it for two reasons, one is I'm pretty crap at achieving consistently accurate cuts, especially at 45° and secondly and more importantly I didn't believe that sort of joint would be strong enough to cope with the load from a pan full of hot stew! 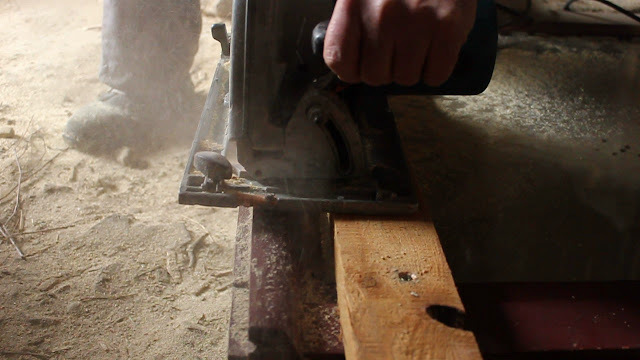 Select the pallet wood for the frames, cut to width (that of the insulation thickness) plane it smooth and cut to length. Four frames are needed (2 for the base and 2 for the lid). To ensure they are all exactly the same size assembled them in a jig. I made this by screwing three straight pieces of wood in a 'U' shape to a piece of chipboard. The size of the U being the size of the frame and the corners at right angles. Position the two vertical legs of the 'U' against the sides of the jig and check that they touch the bottom jig edge, apply wood glue (PVA) at the corners and put the third, horizontal part of the 'U' along the corresponding jig edge. Ensure that all 3 pieces are pushed firmly against their guides and staple or nail where they overlap. Turn the, now joined three wood pieces around in the jig so that the fourth, open side of the 'U' is sitting against the bottom jig edge. Once again glue the corners and position the fourth piece of the frame on top and staple or nail. The reason I used a 'U' shaped jig and not a complete square is that it is much easier to remove the frame by sliding it out rather than trying to lift it. Repeat for the other three frames and then stack all four frames and clamp at each corner and leave to dry. The bottom face of the box has pallet wood planks nailed to the frame to form a solid support. 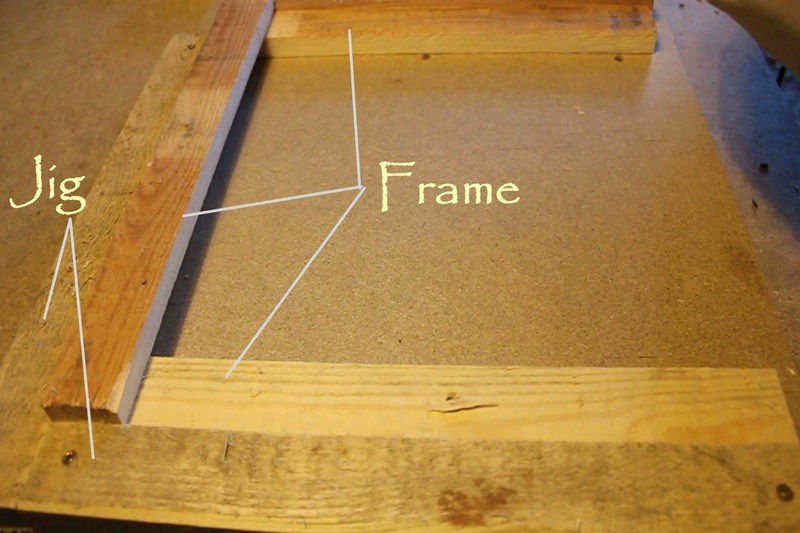 Turn the base over and cut and fit two extra pieces of wood to the frame. This is to furnish a vertical face to which the box walls can be attached. The saucepan is to sit on an insulated platform made to fit into the square recess created in the previous stage. The platform is about 20mm smaller than this recess to account for the wall thickness and is deep enough to fit a square of the 45mm thick insulation beneath it. Being removable it can be taken out and cleaned if there is any spillage. Now comes the clever bit, I already know the height I need for the box base so I measure the internal wall height and include the height of the insulated base. Cut the 10mm cladding to this length. Use panel pins to attach the walls to the base. Ensure a good fit at the corners. The base now looks like this. Prior to fitting the top frame to the base, attach two additional wooden pieces, so as to make a flat surface to the frames upper face. Nail, or staple the top frame to the walls of the base. The box now looks like this. The outside walls can be cut to length and the insulation cut to size for the walls and the insulated platform. The insulation should be a good, close fit to ensure maximum efficiency. Attach the outer cladding. I tend to use the stapler because it's less tedious but panel pins are fine. Cut two carrying handles and fix to the box, screwed through the walls into the upper frame. The insulated platform can then be dropped into the completed base. The construction of the lid is similar to that of the base except that the top outer cover of the lid is put on last. I found that this makes it easier to attach the inside walls to the frames. First, cut the interior walls to length, which is the height of the pan and lid projecting above the box base plus the insulation thickness and the thickness of the cladding covering the insulation. To make the space for the insulation at the top of the lid cut two 45mm wide pieces of wood to the internal dimension of the lid and wedge them in place at the top of the lid, with a few millimetres protruding above the uppermost face. Cut cladding to fit to these two pieces and attach. The cladding must not overlap the edges. Remove this assembly, turn it over and put it back into the lid top. top, cut cladding and attach. 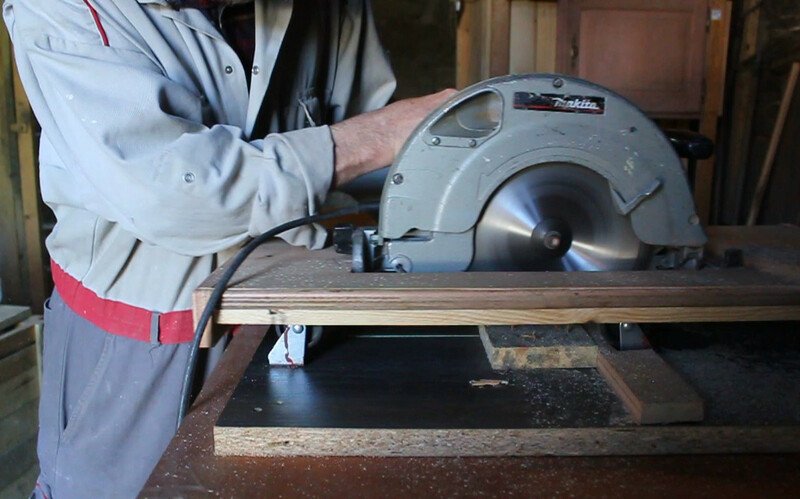 Cut and attach two handles, securing them, as before, by screwing them to the upper frame. To ensure a snug fit of lid to base, cut four pieces of fruit crate wood (5mm pine), to fit around the inside of the lid perimeter and chamfer one edge of each piece. Staple, or nail these pieces to the inside wall of the lid, chamfer facing out and protruding about 10mm. This acts as a guide to align the lid to the base and produces a more effective seal to prevent heat escaping. And there it is all ready for the next power outage, energy price hike or picnic.